Visual Assist build 2098 arrives on the heels of build 2097 to provide support in Visual Assist for Visual Studio Enterprise “15” Preview 2, the IDE that Microsoft released while build 2097 was in the final stage of quality testing. If you installed Preview 2, you should install Visual Assist build 2098. If you don’t use Visual Studio “15” and have our build 2097, you can skip 2098—it will do nothing for you. If you have a build of Visual Assist prior to 2097, install build 2098 and then read what’s new in build 2097. Visual Assist build 2098 requires software maintenance through 2016.05.12. You can find descriptions of this and our previous builds on our what’s new page. If you need build 2098, download the installer. Visual Assist build 2097 introduces support for Visual Studio Enterprise “15” Preview 1, just in time for Microsoft’s posting of Preview 2. If you use Preview 1, you can install build 2097 assuming you installed the IDE using its ISO or web installer. The Visual Assist installer for build 2097 won’t recognize your IDE if you installed it only using Microsoft’s new, “light” installer. Also in build 2097, we implemented a suggestion that came to us from a customer at last month’s Build conference—to support an alternate location for roaming data. The customer envisioned a more efficient way to configure Visual Assist in multiple VMs and PCs. He wants to store data on OneDrive such that a VA Snippet created in one development environment will be available when starting an IDE in his other environments. Build 2097 makes that possible, and OneDrive should work just fine. Also at the Build conference, we learned very few of our customers are aware of, much less use, VA Hashtags. We demo’d the feature regularly, and every viewer was duly impressed. They had no idea such a simple yet powerful feature of Visual Assist escaped them. I mention VA Hashtags for two reasons: if you don’t know about them, you are in for a treat. 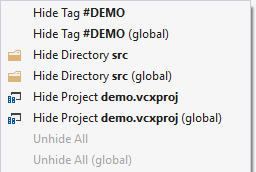 If you do use them, build 2097 makes it a little easier to hide specific VA Hashtags from all of your solutions, usually the VA Hashtags created solely by and for another developer on your team. Build 2097 also contains the typical slew of bug fixes. Learn how to specify an alternate location for per-user data, introduce yourself to VA Hashtags, make global hiding a little easier, check out the complete list of what’s new in build 2097, or download the installer. One final note, build 2097 doesn’t appear on our downloads page because the build throws an exception for first-time users of Visual Assist. If you are reading this blog post, it’s a safe bet you are not a first-time user; you won’t see the exception. Our next build will fix the problem and will appear on our downloads page for all users.